Barely two months after Tesla Motors scored a legislative win against car dealers in the Ohio, a new bill comes to the Ohio State Senate that will ban Tesla's direct sales model for good. And guess who's behind it? The same guy who was behind the last one, state Sen. Tom Patton. Here's why he's so against direct sales. In December, a dealer-backed amendment to an otherwise innocuous traffic bill that would prevent "a manufacturer or a subsidiary, parent, or affiliated entity of a manufacturer" from selling a vehicle directly was defeated in the Ohio Senate after much criticism from Tesla fans and the public in general. Now, The Columbus Dispatch reports that Patton, R-Strongsville has introduced dealer-supported Senate Bill 260, which would do the exact same thing the failed amendment sought to do. Patton would know because he was behind that too. "The state legislature, years ago, recognized having distinct roles for auto manufacturers and dealers fosters competition in the marketplace and provides consumers with a system of checks and balances to ensure that warranty and service issues are administered fairly," he said in an email. "Senate Bill 260 simply reinforces a standard set of rules for all manufacturers and dealers to follow, which benefits both the industry and consumers." Sure, Tom. Whatever you say. The Dispatch story doesn't go into how much money Patton — a state representative from 2003 to 2008 and a state senator since 2009 — has received in campaign contributions from car dealers. But I will! According to a search of Ohio Secretary of State records, Friends of Tom Patton has received a total of $7,550 from the Ohio Automobile Dealers Association Investment Group since 2009. That doesn't sound like a lot, I know, but keep in mind it's been spread over three election cycles and PACs like the Dealers Association can only give a max of about $12,000 in Ohio to senate candidates or other PACs, and you start to realize it's a decent amount of change. That number also doesn't take into account how much Patton got in contributions from individual dealership owners, which is tricky to determine if you don't know who to look for. 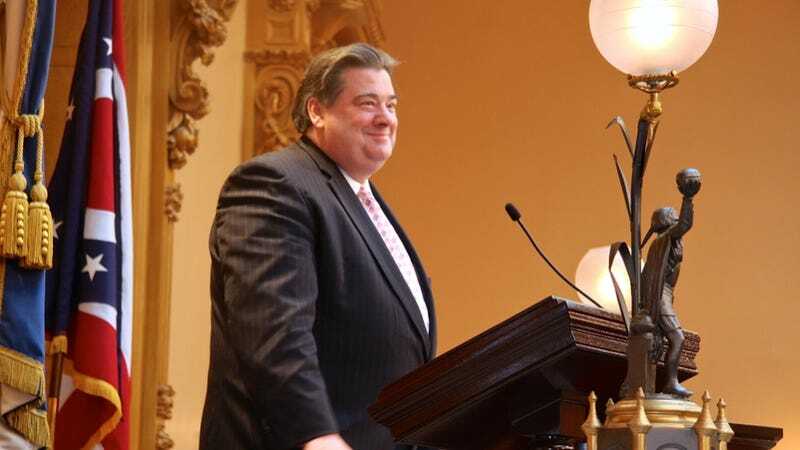 What isn't tricky to figure out is that the Ohio Automobile Dealers Association has given $286,630 to various committees to elect or re-elect state officials in both parties since 2009, according to the same state records. If it sounds just like what happened in Texas, it's because it is. Welcome to politics in Ohio and everywhere else. But you know, competition and checks and balances and all that. Update: Well, it turns out Patton got way more from car dealers than I was able to determine. MediaTrackers reports that between 2002 and 2013, "Patton received at least $42,825 from state and national auto dealership owners, employees, and political action committees."